(CNSNews.com) - The United States added 31,000 manufacturing jobs in February and employment in the manufacturing sector has now increased by 263,000 since December 2016, the last month before President Donald Trump took office. 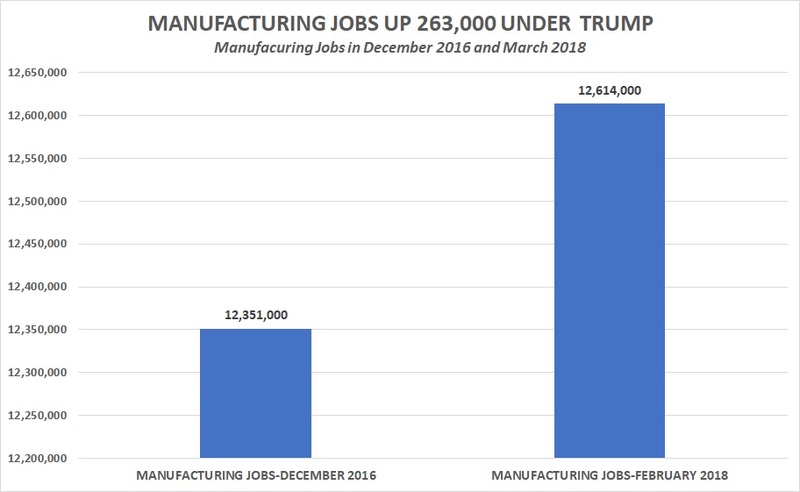 The last time there were more manufacturing jobs in the United States than there were in February was in December 2008, the last month before President Barack Obama took office. That month, according to BLS, there were 12,850,000 manufacturing jobs. But, in January 2009, the month Obama was inaugurated, manufacturing jobs dropped to 12,561,000—and did not move back above 12,600,000 until last month. In December 2016, the month before Trump was inaugurated, there were 12,351,000 manufacturing jobs in the United States. Since then, it has climbed by 263,000 to 12,614,000. In January 2017, the month Trump was inaugurated, manufacturing jobs rose to 12,369,000—an increase of 18,000. In the months since Trump’s inauguration, manufacturing jobs have increased by 245,000.